The unique festival magic of Bestival shone through on new dates at a new location as the event celebrated its 15th anniversary, with Serious Stages supplying stages, site structures, platforms, scaffolding, pa towers and video goalposts, 3-5 August, 2018. August sun shone down on Bestival’s Lulworth Cove, adding a warm glow to this anniversary year, a welcome development after the storm that had afflicted family friendly sister festival, Camp Bestival, the week before. Silk City (Diplo & Mark Ronson), London Grammar and MIA were the musical headliners, with a diverse cultural programme entertaining the 30,000 revellers. 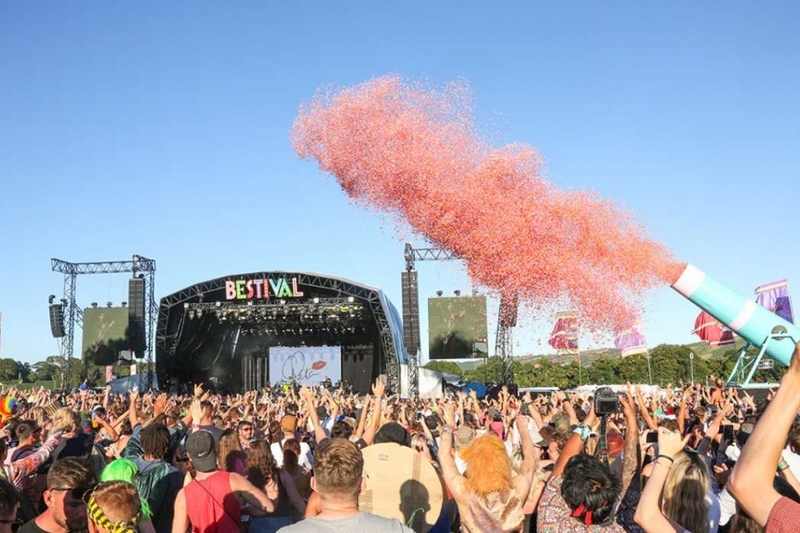 The organisers change of date meant that the practicality of Bestival taking place one week after Camp Bestival introduced cost and efficiency changes, reduced the carbon footprint of the event and generally made life considerably easier. The majority of the infrastructure remained on site with the organisers so the production team and suppliers were under less pressure. Andrew Ridler was project manager for both shows for Serious, who supplied the main festival stage, a Serious 22m Supernova with goalposts carrying video screens either side of the stage, used for both events. The header banner and festival branding was swapped between shows, but the core design of the stage stayed the same. The stage was six arches deep, giving over 40 tonnes weight loading capacity for the multiple artist productions rigged within the roof, with plenty of depth behind the performance area to allow for effective band change-overs. The stage included side wings accommodating monitors and risers with a camera run on front-of-stage. Serious Stages also supplied three low level decking platforms, specifically designed to take the heavy weight containers placed on top as part of the creatively dressed Temple Stage. Stage decking and ground supports were installed into the big top stages, along with front-of-house towers, assisted viewing platforms and scaffold towers for the camp sites.